Mission: The purpose of the Board of Nursing Home Administrators is to protect and advocate for Missouri’s long-term care residents by licensing prospective and current long-term care administrators to ensure the highest quality of care and life in Missouri’s long-term care homes. A long-term care administrator is someone who administers, manages, supervises, or is in general administrative charge of a long-term care facility (skilled care, intermediate care, assisted living and residential care facility II). Function: Duties and responsibilities of the Board of Nursing Home Administrators are to develop and enforce standards for long-term care administrators; formulate appropriate examinations, and; issue, renew, and discipline licenses. The board investigates complaints; evaluates and approves continuing education courses to meet license renewal requirements; controls a trainee program for prospective long-term care administrators; and maintains a register of all licensed long-term care administrators including applicants practicing under a temporary emergency license. Number of meetings: The Board and the Disciplinary Review committee meet bi-monthly. The other committees meet, as needed. Compensation: Members, other than the director of the department, receive a per diem not to exceed $50 for each day devoted to the affairs of the board and reimbursement for realized and necessary expenses. Member Requirements: In addition to the director of the department of health and senior services or the director's designee, the membership of the board shall consist of one licensed physician, two licensed health professionals, one person from the field of health care education, four persons who have been in general administrative charge of a licensed nursing home for a period of at least five years immediately preceding their appointment, and two public members. In addition to these qualifications, the physician, the two licensed health care professionals, and the health care educator shall be citizens of the United States and taxpaying residents of the state of Missouri for one year preceding their appointments. The four appointees who have been in general administrative charge of a licensed nursing home shall be citizens of the United States and either residents of the state of Missouri for one year preceding their appointments or persons who have been licensed by the board and whose five years of employment in a licensed nursing home immediately preceding their appointment have occurred in the state of Missouri. 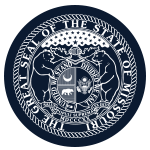 The public members shall be citizens of the United States, residents of the state of Missouri for one year preceding their appointment, and registered voters. The public members shall be persons who are not, or never were, licensed nursing home administrators or the spouse of such persons, or persons who do not have or never have had a material, financial interest in either the providing of licensed nursing home services or in an activity or organization directly related to licensed nursing home administration. Neither the one licensed physician, the two licensed health professionals, nor the person from the health care education field shall have any financial interest in a licensed nursing home.